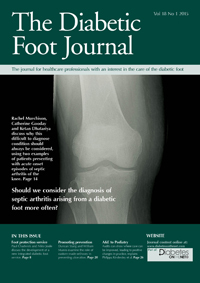 Diabetes is a lifelong condition which can cause foot problems. Some of these problems can occur because the nerves and blood vessels supplying your feet are damaged. 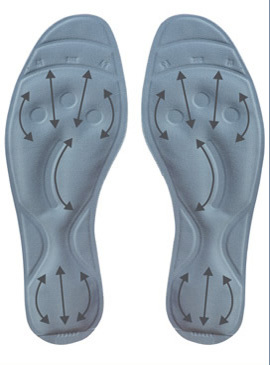 the circulation in your feet (ischaemia). These changes can be very gradual and you may not notice them. This is why it is essential you have your feet screened every year. Controlling your diabetes, cholesterol and blood pressure, and having your feet screened every year by a suitably-trained professional, will help to reduce the risk of developing problems with your feet. If you smoke, you are strongly advised to stop. You should check your feet every day for any blisters, breaks in the skin, pain or any signs of infection such as swelling, heat or redness. You should wash your feet every day in warm water and with a mild soap. Rinse them thoroughly and dry them carefully, especially between the toes. Do not soak your feet as this can damage your skin. Cut or file your toenails regularly, following the curve of the end of your toe. Use a nail file to make sure that there are no sharp edges which could press into the next toe. Do not cut down the sides of your nails as you may create a ‘spike’ of nail which could result in an ingrown toenail. You should change your socks, stocking or tights every day. They should not have bulky seams and the tops should not be elasticated. If you walk barefoot you risk injuring your feet by stubbing your toes and standing on sharp objects which can damage the skin. Check the bottom of your shoes before putting them on to make sure that nothing sharp such as a pin, nail or glass has pierced the outer sole. Also, run your hand inside each shoe to check that no small objects such as small stones have fallen in. Badly fitting shoes are a common cause of irritation or damage to feet. The professional who screened your feet may give you advice about the shoes you are wearing and about buying new shoes. If you check your feet and discover any breaks in the skin, minor cuts or blisters, you should cover them with a sterile dressing and check them every day. Do not burst blisters. If the problems do not heal within a few days, or if you notice any signs of infection (swelling, heat, redness or pain), contact your podiatry department or GP. Do not use over-the-counter corn remedies. They are not recommended for anyone with diabetes as they can cause damage to the skin that can create problems. If you discover any problems with your feet, contact your local podiatry department or GP for advice.